The trade show floor will feature more than 150 business-to-business exhibitors, and an array of education sessions and networking events will take place throughout the day. The American Booksellers Association will hold its Town Hall and Annual Membership Meeting on Thursday, May 31, at BookExpo. All ABA members are encouraged to attend. 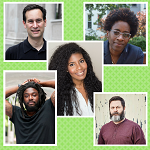 ABA member booksellers attending BookExpo will have the opportunity to meet and have galleys signed by authors like Jacqueline Woodson, Nic Stone, Jason Reynolds, Nick Offerman, and David Levithan. With BookExpo 2018 just one week away, now is a good time to revisit a checklist of recommendations from booksellers who have had success in achieving their key business goals at the show. The program will bring up-and-coming booksellers from around the country to BookExpo 2018 for the opportunity to be fully immersed in the book industry. Booksellers have four opportunities to engage in informal chats with editors in publisher booths between Wednesday, May 30, and Friday, June 1. Barnes & Noble Chairman Len Riggio will focus his talk on the importance of brick-and-mortar stores, serving the modern reader, and the changing landscape of book retail. Booksellers can visit the lounge to meet with Michael Becher, who will answer questions about the survey, review the report’s features, and help booksellers prepare for submitting their store’s numbers. More than 150 pieces of original art will be up for grabs from authors such as Sophie Blackall, Floyd Cooper, Matthew Cordell, Emily Arnold McCully, Aliki, Chris Raschka, Nidhi Chanani, and Lita Judge. The ABA Member Lounge will be the place for booksellers to go for refreshments, one-on-one IndieCommerce consultations, meetings with special vendors, exclusive galleys, and more. The Hudsons are the editors of the upcoming children’s anthology We Rise, We Resist, We Raise Our Voices, which contains writing and artwork from 50 of the foremost diverse children’s authors and illustrators. 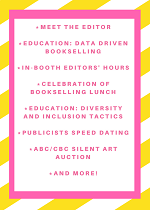 The deadlines are drawing near for booksellers hoping to sign up to mingle with authors at two stellar events at BookExpo. Booksellers attending Children’s Institute are invited to submit questions about the Edelweiss+ platform and join one of two “Ask an Edelweiss Expert” sessions being held at the event. For just $30, booksellers attending next month’s Children’s Institute can reserve a spot for a chalkboard-lettering workshop with a New Orleans artist or a walking tour of the city’s famed French Quarter. Booksellers can gain a wealth of knowledge from education sessions on successful marketing strategies, diversity and inclusion tactics, and bookseller tools such as BookScan and Edelweiss+.